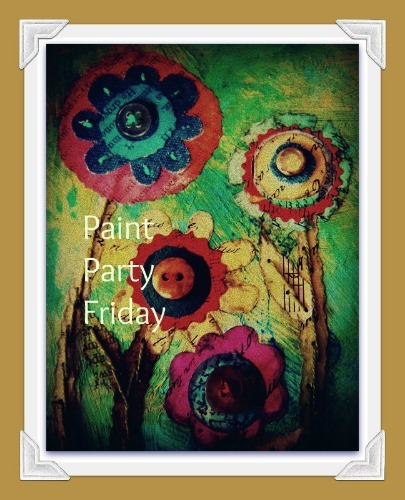 Welcome to Week of Paint Party Friday (Year 2) and to the next edition of our Featured Artist Series! (Would you like to be a PPF Featured Artist? Please click here for details!) Our featured artist this week has been an active Paint Partyer and we are delighted to showcase her lovely and colourful art this week. Please welcome KAT Griffin of Kat's Nature! I have always enjoyed all kinds of art. I remember when I took a special summer art class from a wonderful lady with a thick Spanish accent. She was the best art inspirational teacher ever. She appreciated abstract art, which was my art of choice to express myself in. The nuns at my little catholic grade school didn't quite understand what that was but I was learning to mix color and techniques in shadow and light and perspective …all important things. 2) What are your favorite techniques, media, and tools to use in creating your paintings? My technique of choice is to be impressionistic and colorful and textural. I like all kinds of paint and oils are my favorite. I use palette knives and flat brushes a lot. I recently started using water mixable oil paints and I really like the ease of them and how much better it is to not have to use toxic chemicals. 3) What is your favorite thing to paint? Why? I love to paint nature and birds and lately fresh fruits and cityscapes also. 4) What is your proudest painting moment and/or greatest painting achievement so far? I am most proud to paint something requested by a family member. I did a cardinal for my 80 yr.old father for his birthday and he loves it. I also had a son ask for a lakefront scene of Chicago so I did that for him for his apartment in the city. His wonderful and creative friends all are so kind He told me that they like to look at my art via their computers, on my blog. Some of them started to talk about seeing human figures in the painting of Chicago, so I called it “Ghosts of Chicago”. I did a post all about it a while back on my blog. 5) What's next in your painting future? Right now I am painting another city scape of my town of Cincinnati. I included a view of the oldest bridge in town spanning the Ohio River. It has quite a history I have found. I plan to have a post with photo of that painting finished soon. 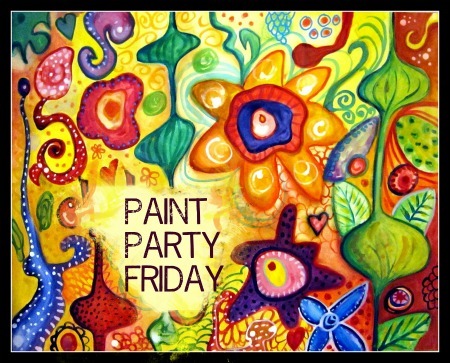 Have a fun time painting and partying this week! Welcome to Week 6 of Paint Party Friday (Year 2) and to the next edition of our Featured Artist Series! (Would you like to be a PPF Featured Artist? Please click here for details!) This week we are featuring an artist all the way from the Philippines whose heartfelt and charming paintings have been delighting us regularly at PPF. Please welcome Patsy Paterno! My whole family is artistic! We've been drawing, painting, sculpting and doing other crafts since we were young. Sometimes all together. We have a family business named papemelroti and we sell our designs there. I really got into painting on canvases only recently. I think a lot of it had to do with my blog and all the positive feedback I was getting! And also because to make a post, you had to CREATE something! So I got the push I needed! I love using found materials, making collages out of painted bookpaper, sewing on buttons from old dresses, etc. I don't like buying expensive materials so I try to find alternatives, like wall putty instead of gesso, transferring images using white glue instead of gel transfer, acrylic paint instead of buying so many stamp pads! I love painting the Word of God, so that it will embed itself in my heart! I also love to do this so I can inspire and encourage others! I draw and paint in my Faith Journal every day. I started my journal in 2006. Before I just used collage because I wasn't very confident with my drawing skills, but I've noticed that I've improved with all the practice! I suppose I am proudest that people want to buy my paintings! A congresswoman in our country commissioned me to make two paintings for her to reprint and give away last Christmas! She gave the prints to her fellow Congressmen and to the children in her gift list. I'm writing a book on Creativity, and have been giving workshops. 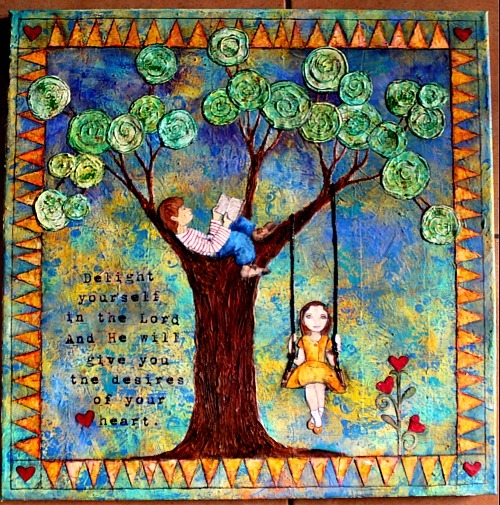 I want to share what I have learned and I want to encourage others to find their creative heart! Hope everyone has fun at the party and a painting-filled week! Welcome to Week 5 of Paint Party Friday (Year 2) and to the next edition of our Featured Artist Series! (Would you like to be a PPF Featured Artist? Click here for details!) This week we are featuring an artist whose vibrant watercolours with their colourful swirls and patterns are always a joy to look at. Please welcome Marcia Beckett! I have painted since I was a child. I was lucky to be able to major in art education at college and painting was always a joy for me. After becoming an elementary art teacher, I took a bit of time off from painting, because I was so busy with the day-to-day lesson planning and keeping up with teaching. In the past couple of years I have made art-making a priority in my personal life. I try to take local classes and attend workshops when I get the chance. I'm also enjoying taking online art workshops to get new ideas. 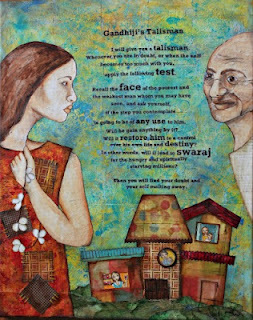 I bounce back and forth between painting and art journaling, often incorporating collage and writing into my paintings. My favorite media is watercolor paint. I love layering colors and painting intuitively (I call it watercolor doodling.) When creating mixed media paintings, I usually start with acrylic paints, add collage elements and then define certain areas with gel sticks. Then, I use white paint to go over and lighten up areas. Insects, birds and flowers are always fun to paint. I like to be inspired by the shapes and colors in fruit, foliage and flowers and interpret them in an abstract way. You can see the influence in some of my watercolor paintings. My first memorable piece of art was in college where I was making a realistic painting of the hallway. I took a break from painting, and walked into the bathroom. While I was in the bathroom, I overheard some older art students mocking the painting I was making. It made me so angry and hurt, that I walked out of the bathroom and completely changed the painting. I turned the hallway into an ominous and expressive picture. Instead of painting in realistic colors, I used red paint for marks on the wall, which kind of resembled blood. After it was finished, I was very pleased with the result and entered it into a local juried art show. It won, 2nd place, for the painting category. I know some of those girls who mocked it were at the show, so it gave me a nice sense of satisfaction. I’m also really proud of being selected to be a contributing editor for the new mixed media art magazine which will be debuting this spring, called Featuring. I get to write articles, interview artists and brainstorm ideas. If you are interested in the magazine or submitting, please check out the website. Hmm… I’d like to continue my series of “Cabinet of Curious Things” which are paintings in a grid-like composition with interesting little watercolor paintings and collage cut outs in the squares. Within the next year, I am going to create an online shop for prints and greeting cards. I’m not looking to make tons of money, but it would be nice to earn a little extra in order to sustain my art hobby. Have a fun time at the party, and a great week to everyone! Welcome to Week 4 of Paint Party Friday (Year 2) and the next of our Featured Artist Series! (Would you like to be a PPF Featured Artist? Click here for details!) This week, we are featuring an artist who creates fascinating mixed-media paintings inspired by nature and lately by the islands of Hawaii. She has an ambitious goal of creating a painting a week and we are always delighted that she shares those creations regularly at PPF. It is our pleasure to introduce you to Mary C. Nasser! I started painting in high school, but my paintings continue to evolve. I think the small thread that has always run through my work is my interest in layers and textures. All of my art is inspired by nature: specifically, landscapes and geology. My love of landscape is revealed in mixed media paintings layered with maps and scientific illustrations. I study physical geology and the interconnectedness between surface and subterranean landscapes: exploring the relationships between developments underground and the evolution of the landscape that takes place on the surface – borrowing images from geological diagrams of land formations to incorporate into my paintings. I am captivated by the idea that geological shifts and transformations seem to parallel both individuals and their relationships: continually changing, varying, shifting and developing, too. My favorite techniques are mixed media acrylic painting and encaustics. I also enjoy the technique of drawing onto paintings with micron pens. As far as media, I love, love, love to use maps in my paintings! It is so much fun to layer maps and paint onto canvas! I sprinkle mica and olivine into my paintings sometimes, too. I also further embellish some paintings by adding text and creating patina word charms. In 2007, I spent time living and painting in the southwest, examining desert landscapes, where the combination of aridity and erosion exposed the earth’s composition, structure, and layers, the relationships between them, and the deep time they represent. After visiting extinct volcanoes in New Mexico, I longed to see active volcanoes. As a result, I embarked on a residency at Red Cinder Creativity Center in 2008, located between the active and accessible volcanoes Kilauea and Mauna Loa, on the Big Island of Hawaii. Immersed in twelve of the world’s thirteen climate zones, I experienced and studied the various landscapes and dynamic geology of the island. I had the unique opportunities of watching landscape being created and standing on the newest land on earth: landscape created by lava hardening into rock, which, in time, will transform into soil where plants will sprout and grow. Consequently, the dramatic volcanic landscapes continue to inform and influence my work. 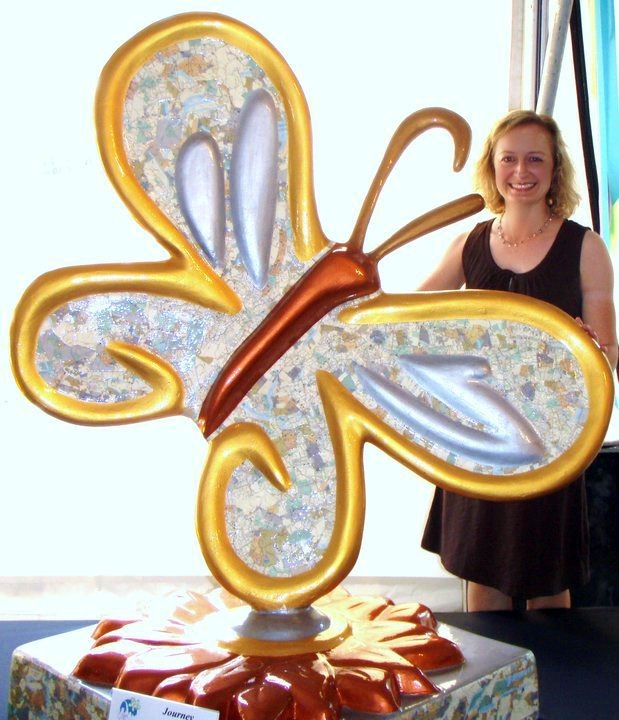 One of my proudest art moments was in 2010, when a jury selected my sculpture proposal for Wings in the City – a project to raise funds for the Jennifer and Jim Koman Expressive Therapy Program at Wings, a BJC pediatric hospice and palliative care program. My 5-foot by 4-foot fiberglass butterfly sculpture is entitled Journey and was sponsored by Plaza Mercedes Benz. It is embellished with metallic acrylics and maps, just like my recent paintings. The butterflies were auctioned off May 21, 2011, at Wings in the City's Art Takes Flight auction. The public art project raised $1.3 million dollars for BJC's pediatric hospice program Wings. What's in my painting future? I'm painting, painting, painting for forthcoming exhibitions! 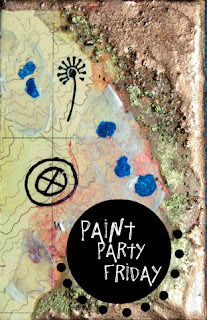 I continue to experiment with paint and mixed-media and look forward to every Paint Party Friday! Thank you very much, Mary! We look forward to seeing you every Friday too! Have a Happy Easter or Passover (if you celebrate) and have a great time at the party! To be a featured artist!